Should we do a first look? There's no right or wrong way to do it – it's your day! Here are some reasons why a first look might be a good idea to consider incorporating into your day. You’re investing a lot into your wedding photography. With a first look, you will most likely receive more photos of the two of you as a couple than you would otherwise… and those are the images you will decorate your first home with! You actually get to have a few minutes of time on your wedding day with your groom. 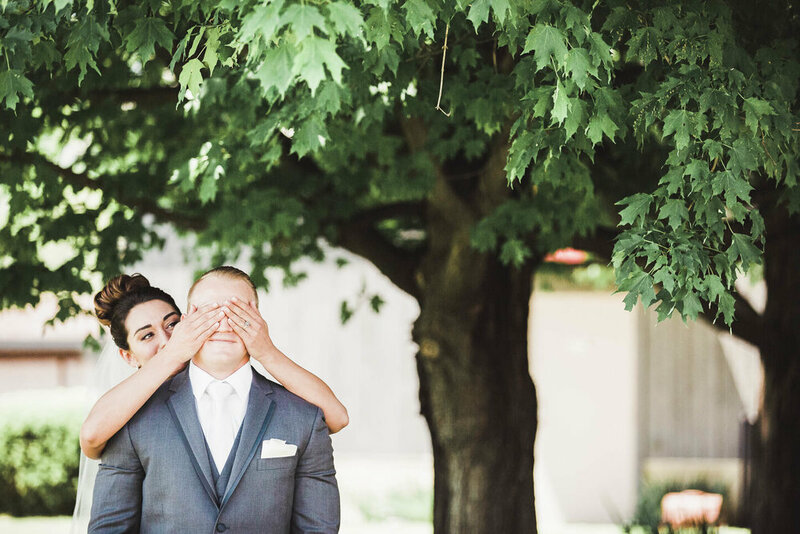 Most brides don’t realize that when you come down the aisle and totally SHOCK him with your gorgeous-ness… he can’t even tell you how amazing you look. He can’t touch you, embrace you or even SPEAK to you. You have to wait until 30 minutes later when the ceremony is over for him to react and tell you how amazing you look. And after 30 minutes of the ceremony, the reaction isn’t the same as the initial first glance. First Looks allow you to extend your wedding day a bit. Under ‘normal’ circumstances, the wedding day would start when you come down the aisle, then the ceremony would end, we rush through family, wedding party, and couple portraits so that you’re not late for the introductions and then it’s reception time. With a first look, your wedding day is extended by quite a bit. It might mean getting ready a bit earlier, but instead of being rushed for your bridal party portraits… you actually get to enjoy them. First Looks allow you to be TOGETHER and alone on your wedding day. SAY WHAT?! I can honestly say that the most enjoyable part of my own wedding day was when I got to share a bit of alone time with my Rich for our portraits. Most of the time, we do the portraits of the bride and groom LAST and it’s rushed. We have to get through family portraits, wedding party, and then the two of you. By the time we get to couples portraits… a lot of people are just over it. They want to eat and enjoy their reception and I get it. First looks can be super helpful to break up the photos and create a more enjoyable photography experience. 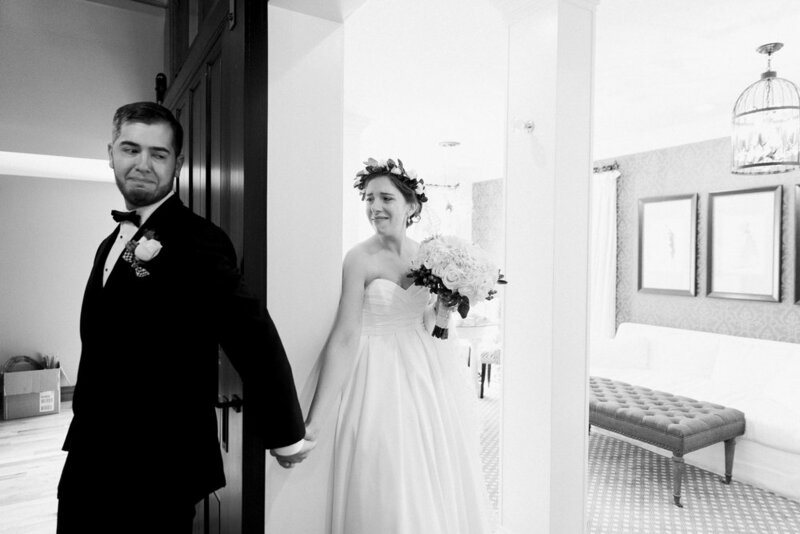 Most couples who have decided to do a first look really struggle with the decision (especially the grooms). 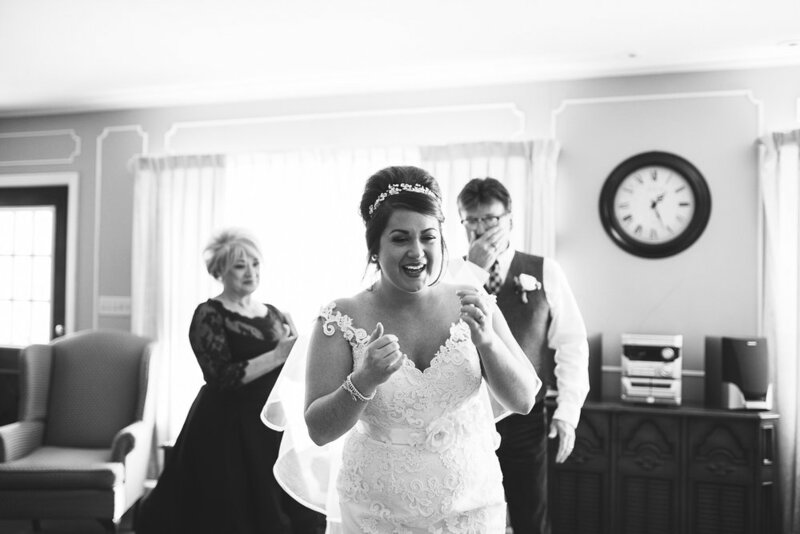 One of the main reasons couples are happy with their decision is that they feel so much more relaxed heading into the ceremony after they’ve gotten the initial first look over with. It’s like taking a deep exhale before the ceremony, and eases a lot of nervousness heading into that huge event! Sometimes a couple wants to share a special moment together but doesn't want to see each other before a wedding, so they hold hands or figure out a way to spend a few minutes 'together' without seeing each other. This is always a cute idea you can incorporate into your day should you choose. Another option is to do a first look with your bridesmaids, or even your father or other family members! To read my full blog post on the pros and cons of doing a first look to discover more on why (or why not) this might be a good choice for you, be sure to check out out the article here. Ultimately, this decision is totally up to you and your groom, and depends on what you’re comfortable with and what will make your day easier. I would never want to push a couple to do something they don’t want, so please know that I completely understand if you think a first look is just not the way you want to start your wedding day. If you have any questions on this, please let me know!